IFA is Europe's big annual gadget show, and it increasingly plays host for new phone announcements. We're expecting news from LG, Samsung, Sony, Motorola, Huawei, and more. We're in Berlin all week bringing you in-depth hands-on reports. IFA is Europe's big consumer tech show. 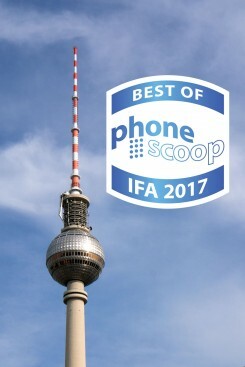 Every year we head over to Berlin to check out everything in person, and honor the standouts with our Best of IFA award. This year, five products really caught our eye. 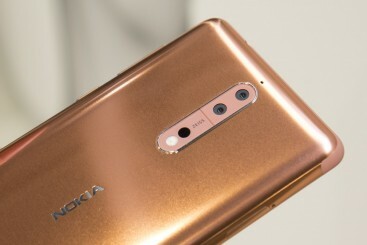 The Nokia 8 is the first flagship phone from the "new Nokia". What separates it from the rest of Nokia's current lineup is the dual-camera system with Zeiss lenses. Zeiss optics were a key feature of old-Nokia phones, so it's nice to see that partnership revived. Not many people have seen the Nokia 8 in person yet, but we managed to snag some hands-on time with it. Read on for our impressions. FitBit hopes to take on Android Wear and the Apple Watch with its new Ionic smart wearable. This fitness tracker on steroids introduces many smartwatch features along with basics such as water resistance, GPS tracking, and music controls. 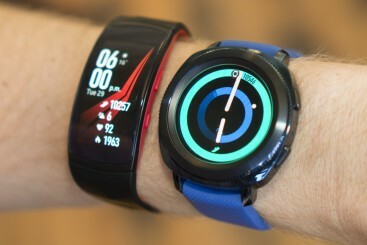 The Ionic isn't cheap, however, and may not be smart enough considering the competitive prices of full-fledged smartwatches. Here are our first impressions of the FitBit Ionic. 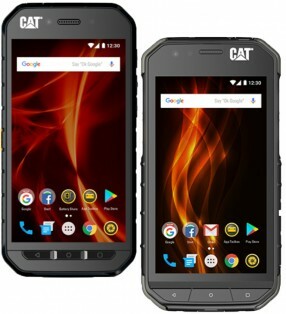 Cat's latest rugged smartphones are the S41 and the S31. These two handsets are tough hombres that can handle plenty of punishment thanks to their mil-spec 810G and IP68 ratings. With stock Android Nougat on board and advanced features such as wet-finger tracking and underwater photography, there's plenty to like about these chunky work phones. Here are our initial impressions. Garmin debuted several new wearables at IFA in Berlin this week, and the Vivoactive 3 is the most powerful among them. This smart-ish watch runs Garmin's proprietary software, rather than Android Wear, and specifically targets fitness-minded folk. It does include advanced features such as mobile payments, but you may be better of with a real smartwatch rather than this half-baked effort from Garmin. 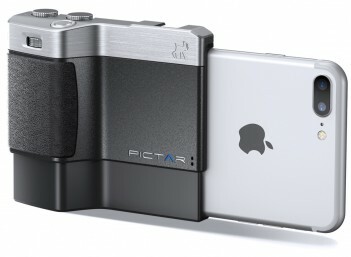 Miggo showed off its Pictar camera grip at IFA in Berlin this week. This accessory works with just about every iPhone from the iPhone 4 through the iPhone 7 Plus. It adds a large grip area to hold onto, as well as hardware buttons for controlling the camera application. Here's a quick look at this $100 accessory. 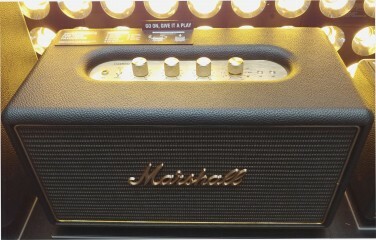 Marshall Headphones, a division of Zounds, debuted a trio of new wireless speakers today. The company took its Acton, Stanmore, and Woburn speaker cabinets and added WiFi radios, giving them incredible powers for streaming media from your mobile device. Here's a quick explanation of what Marshall has under the vinyl lining these attractive in-home speakers. 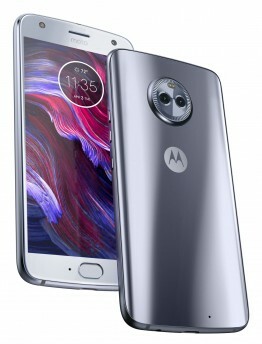 Motorola/Lenovo today announced the Moto X4, the company's new feature-filled, stylish mid-range phone. It has dual cameras, including a 12 megapixel main camera with PDAF, and a 120-degree wide-angle camera with 8 megapixel resolution. The dual cameras are capable of selective focus for a bokeh effect. The camera software can also recognize landmarks, food, and scan codes. It also has a whopping 16 megapixel selfie camera, making it one of the only phones with higher resolution on the front camera. The LCD screen clocks in at 5.2 inches and Full HD resolution. Uniquely, the X4 can stream music simultaneously to up to four different Bluetooth devices. It's rated IP68 for water-resistance, and has a metal frame with Gorilla Glass on the front and back. The camera module on the back has a distinctive "watch face" design. It also includes the Amazon Alexa voice assistant. The front-mounted fingerprint reader integrates with a new Moto Key feature to offer single-sign-on for mobile websites and your desktop PC. The X4 is powered by a Qualcomm Snapdragon 630 processor paired with either 3 or 4 GB of RAM (depending on market.) The 32 or 64 GB of internal storage is expandable with memory cards up to 2 TB. The 3,000 mAh battery supports Turbo Charging. It will come to Europe in September for 400 Euros, with more markets — including the U.S. — to follow later in the fall. Sony today announced the XA1 Plus, a handset that finds some middle ground between the XA1 and XA1 Ultra. It's a mid-range handset that leans heavily on Sony's tired design language. The price point is more attractive than the hardware itself. 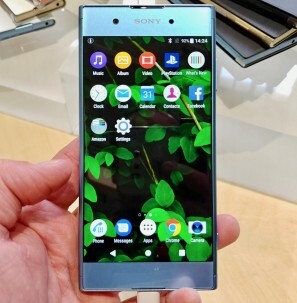 Here are our initial thoughts on Sony's latest Android smartphone. Cat Phones today announced the S41 and S31 smartphones, updates to models from last year. 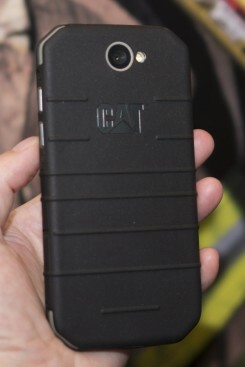 Cat handsets are actually manufactured by Bullitt Group, which licenses the Cat brand. Like most Cat Phones, the S41 and S31 are fully ruggedized mil-spec 810G handsets and more or less impervious to damage from drops, shock, moisture, dust, altitude temperature extremes, and similar dangers. Each is rated IP68 for protection against water and dust. The phones include programmable PTT buttons and run Android 7 Nougat. Each handset has varying degrees of support for U.S. LTE bands, but for the most part they are compatible with AT&T and T-Mobile. Cat S41: The S41 is the more well-spec'd of the two handsets. It has as 5-inch full HD display with Gorilla Glass 5 and wet finger tracking. The S41 is powered by a 2.3 GHz octa-core MediaTek processor with 3 GB of RAM and 32 GB of storage. The main camera has a 13-megapixel sensor with LED flash and PDAF, while the selfie camera has an 8-megapixel sensor. Both cameras can operate when the phone is under water. The battery measures in at 5,000mAh and provides up to 44 days of standby time or 38 hours of talk time. The phone can be used to power up other devices. The S41 costs about $475 and will go on sale in Europe beginning August 31. S31: This handset is slightly smaller than the S41 thanks to its 4.7-inch screen at 720p resolution with Gorilla Glass 3 and wet finger tracking. It relies on a quad-core 1.3 GHz Snapdragon processor from Qualcomm with 2 GB of RAM and 16 GB of storage. The main camera has an 8-megapixel sensor while the front camera has a 2-megapixel sensor. The S31 has a 4,000mAh battery. It goes on sale later this year for about $355. Sony's latest flagship smartphone is the Xperia XZ1. The phone largely carries over the design we saw on last year's XZ handset, but manages to stuff the chassis with a slew of new and exciting camera tricks that make a compelling case for the XZ1. Here are our initial impressions. 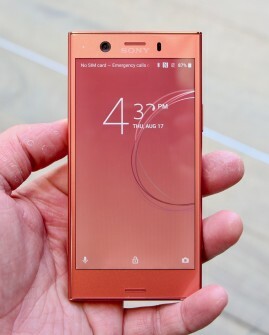 The Xperia XZ1 Compact is a true miniaturized version of the larger XZ1 flagship handset. It includes nearly every single feature offered by its bigger brother, but stuffs them into a more compact and usable piece of hardware. Here are Phonescoop's first impressions of the Sony Xperia XZ1 Compact. 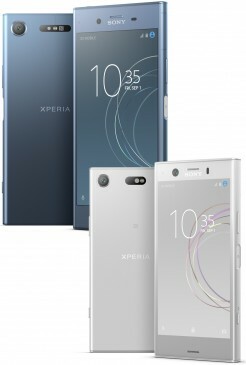 Sony today announced the XZ1 and XZ1 Compact smartphones, two metal-clad flagships that pair novel features with classic Sony looks. The phones share nearly all specs and capabilities, with the XZ1 Compact downgrading only a few components due to its smaller size. Both phones are powered by a Qualcomm Snapdragon 835 processor with 4 GB of memory and 64 GB of storage. The most important feature offered by the XZ1 and XZ1 Compact is the camera, which is a 19-megapixel Exmor RS memory stacked image sensor, the same one found on the XZ Premium from earlier this year. It is able to capture slow-motion video at 960 frames per second and includes a predictive capture mode, autofocus burst, anti-distortion shutter, predictive hybrid autofocus, and 5-axis optical image stabilization. The front camera has a 13-megapixel sensor with f/2.0 aperture and a wide-angle lens. The XZ1 and XZ1 Compact include Sony's new 3D Creator app, which lets people scan objects using the devices' cameras. The software runs in four modes: face, head, food, or freeform, allowing you to capture 360-degree views of just about anything. The resulting 3D images can be shared via most messaging platforms and users can enhance them with stickers, use them as avatars, or even send them to 3D printers for printing. Other shared features between the phones include support for LDAC, digital noise cancellation, stereo speakers with front surround recording, Bluetooth 5.0, NFC, GPS, and WiFi. Both phones include a 2,700mAh battery with Qnovo Adaptive Charging and Qualcomm Quick Charge 3.0. They rely on Qualcomm's X16 modem and support wireless data speeds up to 1 Gbps. The phones are rated IP68 for protection against water and dust. 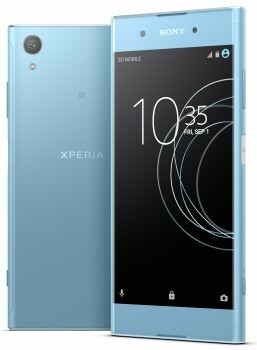 The XZ1 features Sony's loop metal design language and has a 5.2-inch HDR display with the Sony Bravia Engine and full HD resolution. It goes on sale September 19 for $700. The XZ1 Compact relies on Sony's blocky compact design made from glass fiber and has a 4.6-inch 720p display. It goes on sale October 4 for $600. Sony says the XZ1 and XZ1 Compact will be the first phones to ship with Android 8 Oreo. Sony today announced the Xperia XA1 Plus, an update to last year's XA1. This media-focused phone features a metal build with a 5.5-inch full HD display. It is powered by a MediaTek Helio P10 processor clocked at 2.3 GHz with 3 GB of memory and 32 GB of storage. Sony gave the XA1 Plus a 23-megapixel Exmor RS main camera with an f/2.0 aperture and Hybrid Autofocus. The lens has a wide-angle of view and supports HDR photo/video capture, video stabilization, and 5x zoom. The selfie camera has an 8-megapixel Exmor RS image sensor at f/2.0. 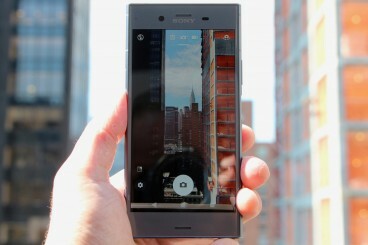 It also includes HDR image capture, anti-shaking tools, and Sony's gesture shutter. Sony was sure to give the XA1 Plus its SmartAmp technology for wired headphones, as well as ClearAudio+ and stereo recording. The phone has a large 3,430mAh battery with Qnovo Adaptive Charging for better battery health, as well as Sony's Pump Express+ 2.0 for rapid power ups. The XA1 Plus ships with Android 7 Nougat and a bundle of Sony-branded apps and services. The phone supports the LTE networks of AT&T and T-Mobile. Sony says the Xperia XA1 Plus goes on sale October 20 for $380. It will be available unlocked online from Amazon.com. The V30 is LG's new top-end flagship, for people who want something even more cutting-edge than the G6. As with previous V-series phones, it sports a huge screen. But the incredibly tiny bezels let LG make the screen much larger, but the phone much smaller, compared to last year's V20. LG has taken all of the features of the G6 and improved them, including a better dual-camera setup, faster processor, and OLED screen capable of VR. The V series continues to support advanced audio, but the V30 adds advanced video features as well, including a feature similar to RAW mode for video. We spent some time with the V30; read on for our first impressions. LG today fully revealed the V30, a phone it has been teasing in bits and pieces over the last few weeks. This flagship-class handset has a metal frame and glass front and rear panels. The V30 does away with the secondary display that adorned the front of the V10 and V20. 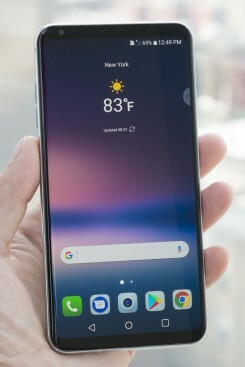 In its place, LG created what it calls the Floating Bar, a semi-transparent strip that gives V30 owners access to frequently used functions, such as contacts and settings. The phone is among the first to use a plastic OLED FullVision display, though it is protected by Gorilla Glass 5. The 6-inch panel has 2,880 by 1,440 pixels, or a 2:1 (18:9) aspect ratio, and nearly non-existent side bezels. LG reduced the phone's upper and lower bezels by 20% and 50%, respectively, when compared to the V20. The phone makes use of an f/1.6 aperture camera at 16 megapixels, a first according to LG. The f/1.6 lens allows 25% more light to reach the sensor when compared to an f/1.8 lens. Further, LG is adopting what it calls a Crystal Clear Lens that's made of glass, rather than plastic. The glass permits more light to travel through it, while also allowing for better color reproduction. Like the V20 and G6, the V30 has a dual camera array with one wide-angle lens and one standard-angle lens with optical image stabilization, laser autofocus, and electronic image stabilization. The secondary lens has a 13-megapixel resolution at f/1.9 and 120-degree field of view. The phone has a Qualcomm Snapdragon 835 processor at its core with 4 GB of memory and 64 GB of storage (the V30+ jumps to 128 GB of storage). Other specs include a 3,400mAh battery with wireless charging and an IP68 rating for protection from water and dust. The Always On Display is more customizable than before and includes shortcuts to Quick Tools, the music player, and even photos. Additional software features baked into LG UX 6.0 include Face Recognition that LG says unlocks the phone instantly even when the display is off. Voice Recognition now uses a combination of the user's voice and self-generated keywords to unlock the phone without any button presses. The V30's camera gains access to Graphy, a tool for applying professional-looking styles to photos and V30 owners will be able to create GIFs or movies by pasting together photos and/or video files. Last, LG said the V30 adopts a 32-bit advanced hi-fi quad DAC from ESS Technology, which reproduces music as close to the original source as possible. 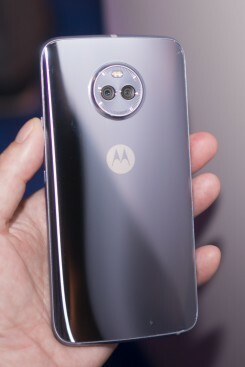 It includes high-resolution audio streaming thanks to technology from MQA Ltd. On the recording front, the V30's HD Audio Recorder can use the handset's audio receiver as a microphone. LG says this lets the phone record a wider dynamic range of sound, "from a whisper to a thunderstorm," without distortion. 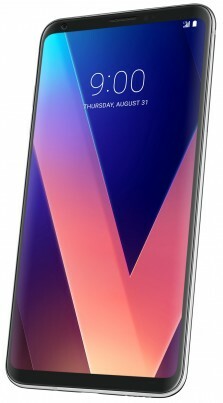 The LG V30 will go on sale in Korea starting September 21 with other markets, including North America, to follow soon thereafter. Pricing was not immediately disclosed. Samsung today announced several new wearables at IFA. They include the Gear Sport smartwatch, the Gear Fit2 Pro fitness band, and the Gear IconX 2018 wireless earbuds. With an expanding range of devices, Samsung hopes people will find the wearable that suits them best. Here are our initial thoughts on these new accessories. 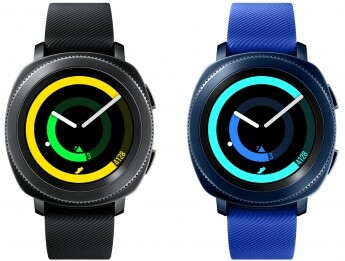 Samsung today introduced the Gear Sport smartwatch. 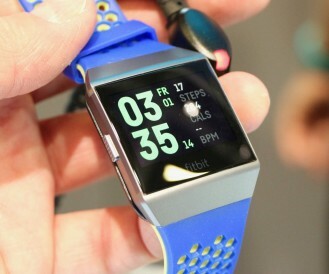 The watch includes a 1.2-inch OLED display and measures 42.9mm, which Samsung says should fit most people well. It is powered by a dual-core 1 GHz processor and includes 768 MB of RAM and 4 GB of storage for music and other files. The device packs a 300mAh battery that Samsung says is good for about two days of use, though tracking workouts via GPS will cut down battery life. Other specs include Bluetooth 4.2, accelerometer, barometer, light sensor, and optical heart rate monitor. It can charge wirelessly and includes NFC for Samsung Pay mobile payments. The device runs Tizen OS 3.0 with some tweaks from Samsung. In particular, Samsung has refreshed its Health and Nutrition platform with more advanced calorie counting and workout tracking. The wearable can automatically track a wide variety of workouts and provide data such as step counts, distance traveled, floors climbed, and more. 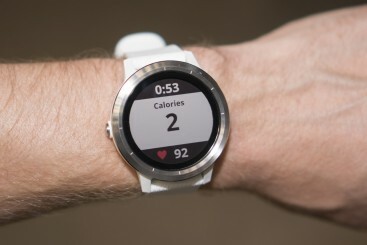 The Gear Sport includes Samsung's rotating bezel to manage the user interface. Two musical buttons along the side also help manage the UI. The device relies on standard 22mm bands and Samsung will provide a variety of straps in materials such as plastic, leather, and woven fabric. The Gear Sport is waterproof to 50 meters and can handle salt water swimming. It also meets mil-spec standards for protection from abuse, such as drops and shock. The Gear Sport is compatible with most Android handsets and even the Apple iPhone. Pricing and availability were not disclosed. 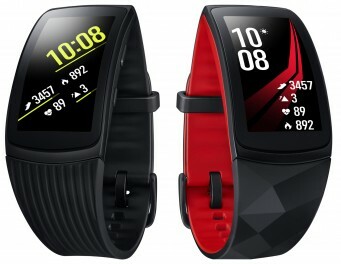 Samsung today updated its dedicated fitness band, the Fit2 Pro. This wearable features a 1.5-inch curved OLED display and runs Samsung's Tizen operating system. The device features a plastic build with a buckle-style strap to keep it firmly in place. The wearable is water resistant to 50 meters and can tackle salt water for ocean-based swimming. Samsung says it meets mil-spec certification for protection from abuse, such as drops, shock, temperature extremes, and high altitude. The Fit2 Pro includes an optical heart rate monitor and can check the wearer's heart rate as often as every second. Other features include GPS for tracking workouts and a bevy of fitness apps, as well as integration with Samsung's Health and Nutrition platform. The wearable includes 512 MB of RAM and 4 GB of storage for holding up to about 500 songs for listening on the go. The Fit2 Pro will be available for preorder starting August 31 and it ships starting September 15. It will cost $199 and will be sold by Samsung as well as Best Buy, B&H, and Macy's. It comes in black and red. Samsung today announced the Gear IconX 2018 wireless earbuds. These Bluetooth headphones are separate buds that come in a charging case. The new model resembles the previous generation but makes dramatic improvements to battery life. Where the originals had just 1.5 hours of playback time per charge, the IconX 2018 offers up to 4 hours of talk time and 5 hours of music streaming. The charging case can replenish the earbuds once, and supports rapid charging to deliver an hour of play time after just 10 minutes. The earbuds include personal coaching (via mobile app) that can help track and guide owners through workouts. The buds can store about 500 songs thanks to 4 GB of storage. Users control volume and other actions via capacitive buttons placed on the outside of each bud. The IconX supports Samsung's Bixby voice assistant (or Google Assistant and/or Alexa) based on user preferences. The IconX will go on sale later this year. Pricing wasn't disclosed. They come in gray, black, and pink. LG today said its forthcoming V30 flagship handset will be its most advanced device yet when it comes to audio reproduction and recording. 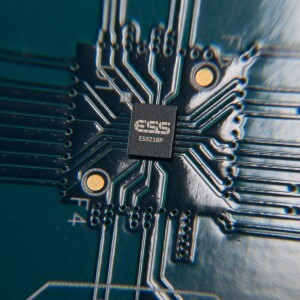 To start, the phone adopts a 32-bit advanced hi-fi quad DAC from ESS Technology. It builds on LG's original hi-fi quad DAC, which reproduces music as close to the original source as possible. The ESS Sabre ES9218P audio processor introduces digital filters and sound presets. According to LG, the digital filters improve the pre- and post-ringing of the impulse response in such a way that they can be easily customized by end users. This works hand in hand with the new pre-programmed presets (enhanced, detailed, live, and bass), allowing even inexpensive headphones to reproduce high-quality music. Moreover, the hi-fi quad DAC manages the left and right audio signals separately, dynamically adjusting balance to ensure listeners remain centered. The new DAC cuts the distortion rate down to 0.0002%, meaning it reproduces the cleanest and most accurate signal possible. Last, the V30 introduces high-resolution audio streaming thanks to technology from MQA Ltd. LG says its advanced hi-fi quad DAC and MQA tech will work together to bring the best sound to music streamed from sources such as Spotify and Google Play Music. On the recording front, the V30's HD Audio Recorder can use the handset's audio receiver as a microphone (Receiver-as-a-Mic or RAM). LG says this lets the phone record a wider dynamic range of sound, "from a whisper to a thunderstorm," without distortion. LG is expected to announce the V30 on August 31 during the IFA trade show in Berlin.